If you are getting ready to lose weight, there's an important bit of information you should be aware of. Most diets fail. For years, the oft repeated claim was that 95% of diets fail. The truth is we don't know the exact number, but it's probably more like 80%.1 People lose weight in the short term, but within a year, most put the weight back on. This depressing news may make you wonder why you should bother at all. But perhaps you can look at it another way. There are a host of reasons why diets fail. If you know what they are, and look out for them, you can buck the odds and keep your weight off. Choosing a diet that allows occasional deviations from the standard plan or that allows a wide variety of foods is a good way to avoid this common pitfall. Stay away from plans that have you eating nothing but meal replacements and celery sticks. Use the diet as an opportunity to try new foods and start new habits. When you discover a new, healthy, allowable food that you like, say cucumbers with hummus, add it to your rotation, but don't eat it so often that you get bored with it. Keep it interesting, and you'll end up developing better long term habits. Losing weight for good requires a permanent lifestyle change. It doesn't mean that you will never be free to indulge in a piece of birthday cake. What it does mean is that you will not be able to have two pieces of cake one day, a bag of chips the next, and a pint of ice cream the day after that. This requires a different mindset than the one you employ while you're on the diet proper. It can be a lot easier to follow a strict plan with clearly drawn limits than a looser set of guidelines that allows you to make your own choices. Staying within the boundaries of a diet will help you lose weight. But only a long term change in your attitude toward, and relationship with, food will keep the weight off for good. Some progressive diets provide guidelines and plans for you to change the way you approach food in the long term, but ultimately the change must occur within yourself. Going on a diet and losing weight can slow down your metabolism for a couple of reasons. First off, when you eat fewer calories for an extended period of time, you experience metabolic adaptation. This is when your body becomes accustomed to the lower energy intake, so it responds by lowering its energy output. It is commonly referred to using the overly dramatic term "starvation mode" when in fact, it is simply your body's natural adjustment to current environmental conditions. Secondly, when you diet, you generally lose muscle mass. The less muscle you have, the slower your metabolism gets. So in order to continue to lose weight, you have to either eat less and less or find ways to rev your metabolism back up. There are a few ways to support your metabolism while dieting. One is to eat more protein. Recent research published in The Journal of the American Medical Association demonstrates that eating a diet high in protein has a positive effect on both lean muscle mass and resting metabolism.4 Another is to include physical activity in your weight loss program. You will burn more calories while exercising, and if you add a weight-bearing component, you will also build muscle mass, which in turn increases metabolism. Additionally, you can use metabolism boosting supplements to support your efforts. Used in combination, these methods can help you avoid this all too common dieting pitfall. Have you ever "cheated" on a diet? Did you let it sabotage the whole day, or week? 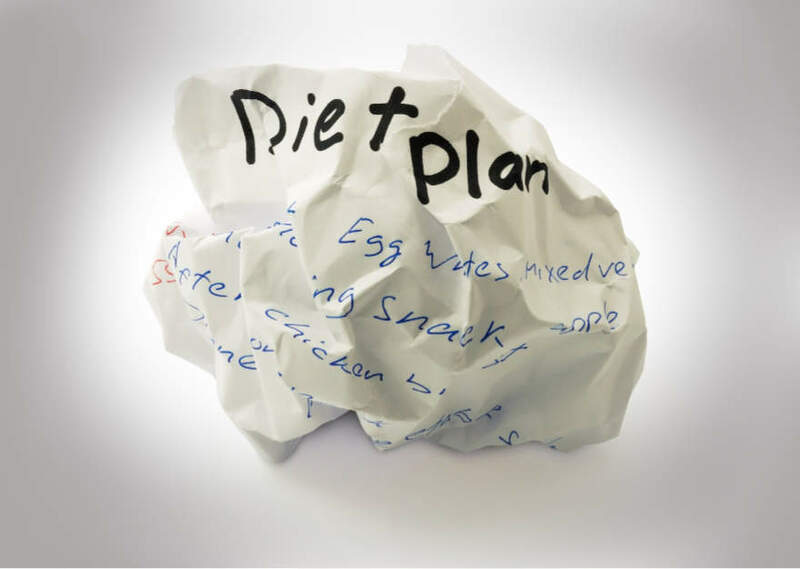 This is all too common for dieters, and according to Dawn Jackson Blatner, a registered dietician and spokesperson for the American Dietetic Association, it stems from all-or-nothing thinking and perfectionism.5 When you commit to a diet program, you have the best intentions, and you don't plan to fail. But you will inevitably find yourself in tempting situations. It is very likely that, on occasion, you will give in to temptation and indulge in something that's not on your "okay to eat" list. Blatner's advice is to let yourself off the hook. Constant deprivation is not realistic, and holding yourself to that standard will sabotage your best efforts. Don't plan to completely avoid all your favorite fattening foods. Understand and accept that there will be occasions where you will want indulge. Plan for them. Have your indulgence, and do it without guilt. This will help keep you from getting derailed by it. One slice of pizza will not undo all your progress. If you know and accept that, you can keep it to one slice, then move on. Despite the high failure rate, it is achievable to lose weight and keep it off. Being aware of the potential pitfalls, you can make a plan for how you will avoid them. Think of it not as dieting, but as living a healthier lifestyle. And above all, be realistic with yourself and don't let your need for perfection sabotage your results.